October is National Home Security Month. Its aim is to provide top tips and advice on how to keep your family and your property safe this winter. Week 1 – provides simple tips and advice on home security. Week 2 – looks at traditional security solutions for protecting your home and your valuables. Week 3 – focuses on the growing smart security industry, and how it can provide you with home security at the touch of a button. Week 4 – raises awareness surrounding the darker nights to coincide with the clocks going back. Week 5 – provides seasonal advice to coincide with the increase in thefts around Halloween and Bonfire Night. Ensure all doors and windows are closed securely and locked. Make sure keys are hidden out of sight. 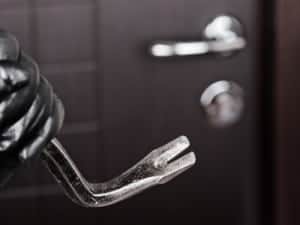 Ensure garages and sheds are locked so tools and ladders can’t be used to break into the house. Lock side gates and leave wheelie bins inside the back garden so they can’t be used to climb over the gate. Install an intruder alarm system. Invest in a safe for valuables. Photograph and mark items of sentimental or monetary value with your postcode. Don’t leave keys, wallets or ID documents within easy reach of doors, letterboxes or windows. Leave the radio on when you are out. Use timer switches to turn lights on and off around the house at different times. Install dusk to dawn or sensor lighting to the front and back door of your home. It will help you gain entry into your home in the dark and deter burglars. Restrict access to the back of your property with high boundaries but keep front boundaries low to reduce hiding places and increase visibility from the street.